The Arkansas Korean Catholic community meets at the Church of St. John the Baptist in Hot Springs where Mass is celebrated in Korean on occasion. The Saturday liturgy starts at 6:30 p.m. and Sunday liturgy starts at 1:30 p.m. A potluck meal follows. 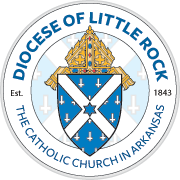 Because the dates and locations of the Masses change frequently, those interested in attending should call Jinho Zyung at (501) 258-5887 or the church at (501) 623-6201.